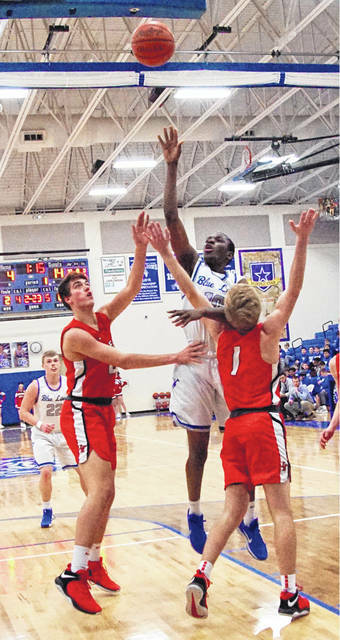 Washington Blue Lion senior Blaise Tayese puts up a shot over two players from Logan Elm, including senior Evan Huffman (1) during a non-conference game at Washington High School Tuesday, Jan. 29, 2019. On the eve of the coldest day of the winter thus far, the Washington Blue Lions hosted the Braves of Logan Elm High School for senior night Tuesday. Logan Elm came away with a 51-42 victory. The Braves improve to 8-8 overall, while the Blue Lions are now 10-6. The Blue Lions made 17 field goals in the game, while Logan Elm made 18. Logan Elm scored seven points from the free throw line to six for the Blue Lions. The difference was, the Braves hit eight three-point field goals, including seven in the first half, to just two for Washington, one of which came at the very end of the game. For the Blue Lions, seniors Blaise Tayese and Richie Burns each scored 10 points. Senior Evan Upthegrove had eight points and senior Omar Porter added five. For the Braves, sophomore Gabe Chalfin was the game’s leading scorer with 15 points. Sophomore Jason Sailor scored 13 and another sophomore, Isaac Ward, scored 11 points. Yet another sophomore, Jeremy Wietelmann, threw in eight points for the Braves. The Braves are one of the younger teams Washington has faced this year as they start four sophomores and one junior. The Blue Lions made 2 of 8 from the floor in the first quarter, while Logan Elm hit 4 of 9, all four of which were three-point baskets, including three from Ward, to take a 14-7 lead at the end of eight minutes of play. Washington made 3 of 9 shots in the second quarter to 7 of 10 for the Braves, including three more three-point field goals, to take a 31-14 halftime lead. The Blue Lions made some adjustments and limited Logan Elm’s open three-point looks in the third and fourth quarters. Washington won the third quarter, 13-9 to trail 40-27 after three complete. Washington was able to pull to within six points and had possession of the ball with about four minutes remaining in the game. Logan Elm outscored Washington 8-5 down the stretch to get the road victory. “The threes weren’t the problem, they were the result of the problem,” Washington head coach Connor Scott said. “The problem was we couldn’t keep them in front of us. They would drive the middle, which forces us to help, which, they do a good job of kicking it out for threes. They’re going to make threes. We had to stop them from shooting them. “In the second half, we won, 28-20, because we stopped them from getting wide-open threes,” Scott said. “They’re going to make wide-open threes, that’s what they do. “I thought our intensity was really good in the second half,” Scott said. “I hope we can build on that, but, basketball is four quarters and if you don’t play two of them, you’re not going to win many games. “It was a great start for us,” Logan Elm head coach Doug Stiverson said. “That’s something we haven’t done consistently this season. That’s something that has hurt us, especially in our losses. “To come out on the road and to play well early, that gave our kids a lot of confidence,” Stiverson said. “We were able to feed off of that and I think that was the difference in the game. “(Washington) is a very good basketball team,” Stiverson said. “We were very concerned about rebounding. We wanted to make sure we could rebound the basketball and we felt like that was going to be a big key for us. I don’t know what the final stats were on rebounding, but I thought we did a decent job rebounding tonight, limiting them to one shot most of the time. Logan Elm is back in Mid-State League action Friday at Circleville and then the Braves will be at home Saturday for Bloom Carroll. Washington returns to Frontier Athletic Conference action Friday at McClain. The Blue Lions travel to Vinton County Saturday night. WASHINGTON — Eli Lynch 0-0-0; Evan Upthegrove 3-2-8; Miguel O’Flaherty 1-1-3; Blaise Tayese 4-2-10; Garitt Leisure 0 (1)-0-3; Karson Runk 0-0-0; Omar Porter 2-1-5; Brice Cartwright 0-0-0; Drew Moats 0-0-0; Richie Burns 5-0-10; Ethan Rogers-Wright 0 (1)-0-3; Mitchell Lotz 0-0-0. TOTALS — 15 (2)-6-42. Free throw shooting: 6 of 8 for 75 percent. Three-point field goals: Leisure, Rogers-Wright. Field goal shooting: 17 of 39 for 44 percent. Turnovers: 7. LOGAN ELM — Luke Watson 0-0-0; Evan Huffman 0-0-0; Jeremy Wietelmann 0 (2)-2-8; Luke Baldwin 1-0-2; Isaac Ward 0 (3)-2-11; Jason Sailor 3 (2)-1-13; Gavin Ewing 0-0-0; Gabe Chalfin 5 (1)-2-15; Jared Harrington 1-0-2. TOTALS — 10 (8)-7-51. Free throw shooting: 7 of 10 for 70 percent. Three-point field goals: Ward, 3; Wietelmann, 2; Sailor, 2; Chalfin. Field goal shooting: 18 of 37 for 49 percent. Turnovers: 7.